Description: Looking east,Mike tower is to the left behind the engines. 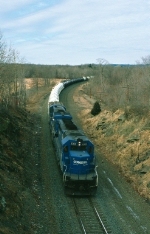 Description: Grain train GRM-21 eastbound at Kistler. 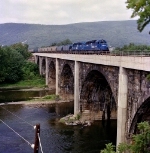 Rockville bridge is the biggest, but the old Pennsy Middle Div. has a number of other good sized stone arch bridges along it's route. Description: Acid trains ran on the tier a brief period of maybe 6 months before going back over to the Riverline. Description: CR 6411 and ATSF 2905 northbound. Description: ML 440 rolls toward the NY 17C overpass with 63 auto racks for the unloading facility at Doremus Av in Newark.